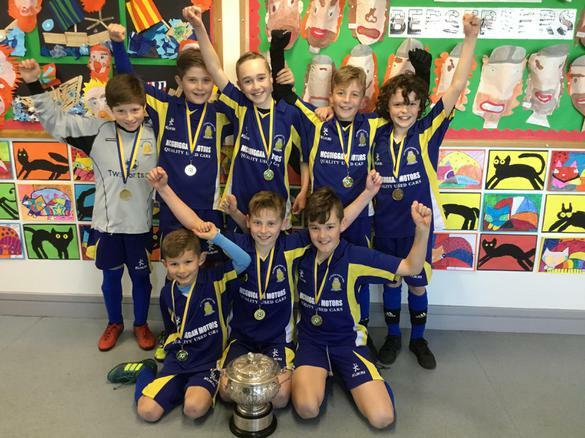 The taste of victory was sweet yesterday, as our senior boys' football won the Lisburn & District Primary School League for the 1st time in our history! As a school we always make it through to the finals day playoffs - when the top four schools of the year play a round robin event for the title of Champions. As a school we have been the 'bridesmaid' on eight occasions finishing as runners up in the tournament and so we were delighted this year to have finished the job and especially for Mrs Reid and Miss Ellison (neither of whom slept on Thursday night). This year the boys played matches against Downshire PS (drawing 1-1 after a last minute Downshire equaliser!) They beat Harmony Hill 1-0 and St Colman's 2-0. Having topped the table of the 22 schools competing in the league since September - they finished the task as undefeated worthy champions. Next 'target' is the double with a cup win in the Spring! As is now tradition for any team bringing home silverware to the school, the boys are now looking forward to their 'Golden Arches' (McDs) lunch as a special celebratory treat....however apparently the managers think the venue should be upgraded.